Quite a fearsome knife, not for the timid collector but absolutely singular in design and workmanship. 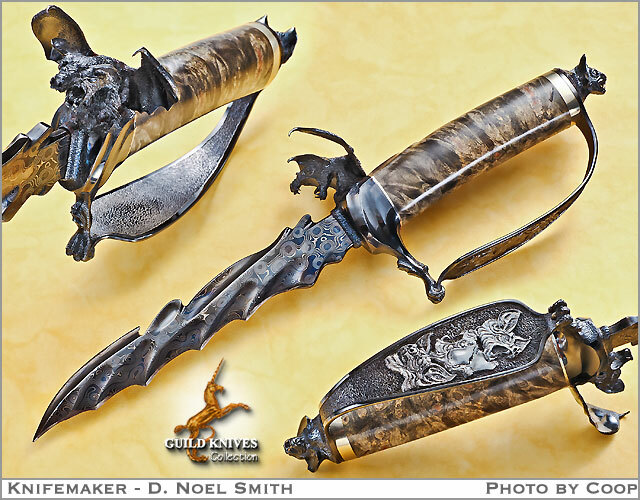 D Noel first carved the depictions in the lost wax technique, the guard bat sculpture, and the seething bat pommel. Then Smith cast the effigies in bronze. Finally he heat blued the furnishings of the handle and and attached them to the handle of some an exotic burl hardwood. Noel forged the damascus blade, carved it and blued it to match the guard and pommel. This strangely weird fighter has three bats deeply engraved and snarling on the outside of the D guard. Bat sculpture on integral guard.